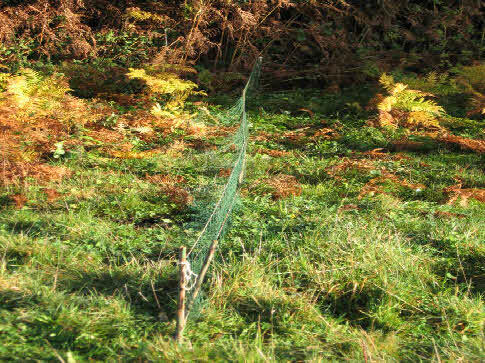 Long nets can be used in situations where burrows cannot be easily netted over, for instance a dense hedge row. The idea is that when a rabbit bolts into the open to escape, it run into the net. The rabbit is then dispatched while in the net. Long nets can be 200 feet long or more, the one shown is 20 feet. They can be used to surround a whole warren or placed like a fence across an escape route. To function correctly the ground needs to be clean and level .The top and bottom cords need to be taught between the end supports, the bottom cord touches the ground so a rabbit does not go underneath. Intermediate sticks support the upper cord in a notch in the top of the stick, while the lower net is held in place by the same stick. The net needs to be baggy in the direction the rabbit is expected to run to. The pictured net is prepared for a rabbit run into it from the right, thus it would run into the bag of the net.